With their sophomore release, Honor Is Dead, Wovenwar is returning with an album driven by a far darker lyrical theme than that of their 2014 self-titled debut, hitting with devastating force and existing on a knife edge. The emotion poured into every song is the kind that cannot be faked. "Going into following up our debut, there was an intense, emotional current I believe we were all itching to tap into," states guitarist Nick Hipa. "Aware that would yield a 'heavier' record, our approach was the same as it has always been: to write great songs." 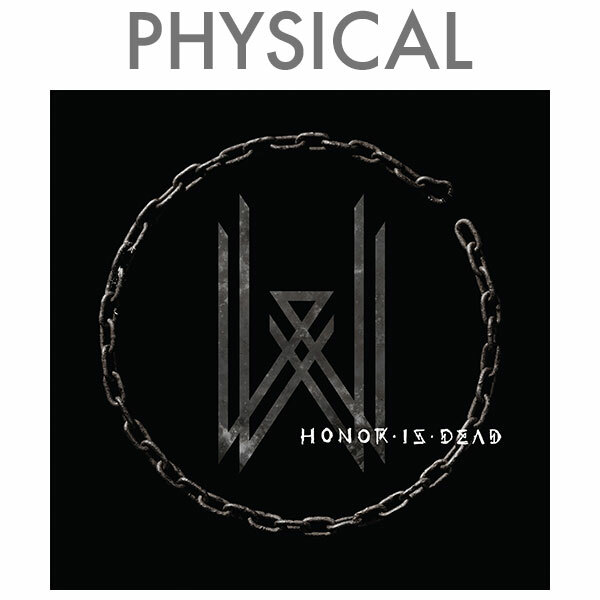 To refer to Honor Is Dead as "heavier" is perhaps an understatement. The weight of the technical yet lithe riffing - combined with Jordan Mancino's thunderous, inimitable drumming and vocalist Shane Blay's visceral performance as he delivers lyrics rife with anger and frustration - makes the record's soulful, engaging predecessor seem almost lightweight by comparison. "I knew I wanted to be more lyrically honest and blunt," Blay says. "I knew I wanted the lyrical scope to include more than just personal struggles. We opened the door to much bigger issues on this record, and I think the content forced my voice to be more dynamic." From their inception, Wovenwar was faced with a struggle few bands will ever encounter. Following the highly publicized incarceration of As I Lay Dying vocalist Tim Lambesis, the remaining band members - guitarists Nick Hipa and Phil Sgrosso, drummer Jordan Mancino, and bassist/vocalist Josh Gilbert - were determined to not lose the profound chemistry the four had developed between them. Recruiting Blay, of metalcore unit Oh, Sleeper, they forged on by creating a new band that would be something much more than AILD Mark II. After dropping their debut, they hit the road and started the work necessary to build something that stands on its own merits, but Hipa is typically philosophical when considering the progress Wovenwar has since made. "We're definitely converting people and gaining new fans, though it is hard to completely replace in a year or two what we had built over the course of a decade with As I Lay Dying. All is good though, and we are very appreciative to have the ears of those who will lend them." Their self-titled record drew criticism from some fans purely due to the lack of screaming, which was, in part, due to their intent to establish themselves as a different band. While Blay also points out that the music simply did not lend itself to screaming, he has learned to ignore the negative internet commentary. "For a while, I put my ear to the ground and listened to criticisms of my voice and how I chose to use it on our debut - and learned that doing that is completely counterproductive to being creative. I still to this day get hateful things said by people, but it's overshadowed by the fans I've met that tell me Wovenwar's music has gotten them past a dark point in their lives." Not only more aggressive, immediate and urgent, Honor Is Dead is also a more fluid record. In part, this stems from being written with contributions from all members, while the music for the first record was mostly written before Blay joined, and meant adding lyrics and vocals to "already concrete ideas". That the record took a more aggressive, confrontational form is largely born of circumstance, and what happened when the members wrote from the heart. "Part of it was just our response to the previous year of our lives," explains Hipa. "Our first response to most negative experiences is usually looking at the bright side or finding silver linings. Generally most of us feel like that's a decent way to approach things. But, without the catharsis of 'letting it out', there is no balance, and that sort of positivity can end up feeling a bit contrived, so half of it is that we simply needed to be angrier. The other half is that we did miss having those heavier songs that are so enjoyable to play live, and we felt our performances could be more enjoyable if we had some more aggressive bangers." The result could aptly be described as "riff nirvana", with the two guitarists cutting loose with some of the best of their career. Whether it's the powerhouse riffs of "World On Fire", the chunky stabbing of "Censorship" or furious fret-destroying of "Stones Thrown" - which is easily one of the heaviest tracks 2016 will see - Hipa and Sgrosso deliver, and then some, Blay also contributing guitar this time out. While it is possible to build a killer record on titanic riffs alone, Wovenwar is a far more dynamic beast, and Honor Is Dead also sees them expand upon the ruthlessly catchy melodies and hooks of their debut, making for a listening experience with real depth, and a broad emotional range. That their choruses are uniformly stunning, soaring entities hammer this home even harder. "The culmination of experience and great production partnerships in the past have honed our ears towards strong, effective parts, and especially choruses. We always look for ways to make things hit and move us. If we succeed in doing that with ourselves then we're positive it has the capacity to connect with others. It's cumbersome at times and takes brutal honesty, but hearing something back that sounds huge and appealing is always worth it," states Hipa. "Josh and I learned a lot on the last record about what our voices can do, separately and together," Blay adds. "This time around we really went to great lengths to optimize who does what and where. I was very adamant about him singing more overall on this record. He has such a balls-out strong voice, and it needed to be used." Taking a path of its own is standout track "Silhouette", a more atmospheric song that somehow manages to be both understated and cinematic, built upon electronic elements, and showcasing a more tender side to the band. "That's actually the oldest song on the record, in that Nick and I wrote it for a different project back in 2012," Blay says. "But it has the youngest lyrics. I'm getting married next year and I couldn't in all good conscience have a record without a song dedicated to my bride to be." While Blay certainly digs deep into his own experiences when it comes to the lyrics, he is also strongly influenced by the bigger problems facing us all at the moment. "Writing lyrics in 2016, you can't help but notice real world issues that are happening all around us. The political circus, terrorism, hate crimes, injustice. All were lyrical fodder for this record, along with my personal struggles." With "Stones Thrown", he casts his eye on the media's ability to lie and cause rifts within society, while "Confession" embodies its title, with Blay speaking out for the first time about his daily struggles with alcohol, and "Lines In The Sand" looks at the idea of "nationalism". "This came out of several conversations about that subject. There are invisible lines, drawn by governments or long dead societies, yet they give cause to hate people on the other side of the line? It's a topic very much worthy of analysis." The title itself refers to the issue of trust, and how readily that is broken, rather than being honored by those in whom this trust is placed. "It highlights a lot of experiences we've had where the trust within relationships or ventures has been broken for one reason or another," Hipa says. "I think everyone has been on the wrong side of someone not keeping their word and you end up feeling totally burned. It's something to be learned from, and in time you simply become more cautious. It's a growing pain of real life, and it's on us to decide how to live in a world that ends up being greyer than the black and white of our youth." With the music and lyrics locked, the band chose not to converge on the same studio to lay down the record, taking advantage of modern technology instead by recording their individual parts in convenient locales across California, Alabama and Texas - which was not without its downsides. "Recording separately across multiple states at different times with a mixing engineer bouncing between multiple countries made things very tricky," Hipa admits. "Luckily we've all made records before and everything ended up working out." The results speak for themselves, capturing a band that sounds truly unified, and hungry. Having had a good experience when touring their debut, and feeling very moved by the support given to them by those who fell in love with the record, they're excited to build upon the groundwork they have already laid. More importantly, having poured their hearts into Honor Is Dead, they hope it will make a genuine difference to those who hear it. "We hope this record connects with people in a manner beyond entertainment," Hipa says. "We hope the music elicits an emotional response, and there's enough universal contemplation for the lyrics to truly mean something to listeners."